It started with a simple idea: virtuoso musicians and a pop singer joining to make new-fashioned music the old-fashioned way. A band followed, evolving into Flying Colors. 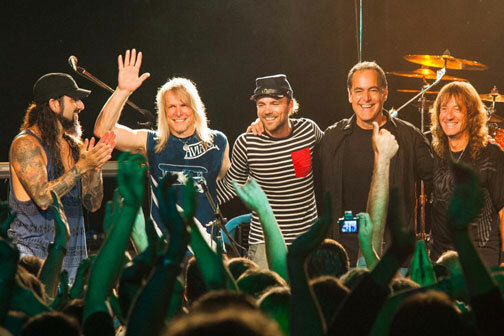 Mike Portnoy (drums and vocals), Dave LaRue (bass), Neal Morse (keyboards and vocals), Casey McPherson (lead vocals), and Steve Morse (guitar). Together, they create a unique fusion of vintage craftsmanship, contemporary music and blistering live performances. In 2008, executive producer Bill Evans began putting the idea into action. It needed exactly the right musicians. In addition to being extraordinary players and writers, they would also need to be a natural creative fit, complementing each others’ abilities. There would be proven chemistry from past collaborations, but the new band would be different from anything they’d done before. The world didn’t need another supergroup! As heard on all of their classic albums, there was also a strong production team who, creatively, would be an extension of the band. A visionary producer, imaginative engineer and compelling visual artist. Though they were seasoned musicians with impressive backgrounds and catalogues, this would be new territory for most of them - and without a budget or record label, they came together with nothing more than a shared vision to create something quite special and unique. “I was the fool who literally stopped production at Electric Lady during mixing to have Revoice Pro used on the album. There was a lot of eye-rolling, but when everyone heard the results…well, you know what your software does!" Peter Collins had helmed the intersection of virtuoso and pop music better than anyone. Collins presided over Rush’s evolution from long-form prog band to short-song rock band, producing four studio albums with them and helping drive 30 million in sales —without ever sacrificing their artistic integrity. His resume of more than 100 albums also included straight-forward popular acts including Bon Jovi, Jewel and Elton John. But when it came time to mix the album, there was only one person in mind - veteran engineer Michael Brauer. From Bob Dylan and The Rolling Stones to Coldplay and John Mayer, Brauer was one of those rare sonic artists who not only kept up with the times but continually re-defined them. Mixing commenced in November 2011, with Brauer molding each track’s myriad sounds and textures into the finished songs heard on the album. “VocALign ARA has really changed the way I work. The time to set up, tweak, and manage VocALign has evaporated. I can now fit it into any timeline, with more flexibility, and be even more creative with it. VocAlign is ESSENTIAL. ARA makes it EASY. Just not everybody knows it! There is NOTHING like it." But how did Revoice Pro play such an important part during the album creation process? Bill Evans comments: "I was the fool who literally stopped production at Electric Lady during mixing to have Revoice Pro used on the album. There was a lot of eye-rolling, but when everyone heard the results…well, you know what your software does!" "VocALign ARA has really changed the way I work. The time to set up, tweak, and manage VocALign has evaporated. I can now fit it into any timeline, with more flexibly, and be even more creative with it. There is NOTHING like it. You can stack guitars to create HUGE sounds, impossible with anything else and VocAlign’s ability to create huge vocals is the secret in the pop music industry that guys like Dr. Luke and other use to make pop stars sound like they can sing by making their voices big. VocALign is ESSENTIAL. ARA makes it EASY. Just not everybody knows it!" Flying Colours have since gone on to make more albums, including their nationally charting Number 1 'Live In Europe', with further releases in the pipeline. Their other project called the Neal Morse Band continue to tour.